There is continued reliance on conventional veterinary drugs including anthelmintics, to some of which resistance has developed. Loss of indigenous technical knowledge (ITK) from societies affects the opportunities for utilization of ethnopharmacological practices unless properly documented. This study was conducted to identify common traditional practices using medicinal plants against helminthosis and other livestock diseases in Mpigi and Gulu districts of Uganda. Seven focus group discussions with ten farmers per group plus 18 key informant interviews were held in each district from August to November 2011. Ranking was used to quantify disease burdens and to identify priority livestock and breeds. Samples of each plant were submitted to Makerere University herbarium for identification and documentation. The local name, relative availability and International Union for Conservation of Nature (IUCN) status were recorded. Seventy six farmers in Mpigi and 74 in Gulu were interviewed. Theileriosis and helminthosis were the most common disease conditions in cattle and goats, respectively. Forty plant species within 34 genera from 22 botanical families were identified, with 20 of these used against helminthosis. Other plants treated wounds and ecto-parasites, theileriosis, retained placenta and bovine ephemeral fever. Non-plant practices (7) and plants cited were used in combination depending on availability. Males older than 40 years had most ethnopharmacological knowledge. Most plants (75%, n = 40) were common, but 10 were rare. IUCN status was not evaluated for 95% of these plants. Conventional and traditional drug use in Gulu and Mpigi districts was different (χ2 = 24; p < 0.001). The scientific, English, Luganda and Acholi names of all plants and their availability within the communities are documented herein. This is the first detailed livestock-related ethnopharmacological study in Gulu district. Farmers in Uganda are still using a variety of practices to treat livestock ailments. Scientific validation and evaluation of conservation status are urgently needed to ensure future availability and knowledge about these plant resources. Cattle and goats are the main livestock ruminants kept in rural communities in tropical Africa . In Uganda, more than 80% of the rural population relies on agricultural production, with a varied focus on livestock and crop agriculture depending on the agro-ecological zone . Livestock diseases greatly affect animal welfare, health and productivity, and lead to high treatment costs, losses through reduced growth, unchecked morbidity and mortality [1, 3, 4]. Helminthosis is among the most debilitating livestock conditions, costing farmers millions of Ugandan shillings through lost production and control efforts [2, 5, 6]. Notably, gastrointestinal nematodes cause poor weight gains, reduced production, severe weight loss or even direct mortality, especially in small ruminants in resource-poor farming communities . Although many alternative control strategies for helminthosis, such as pasture management [7–9], use of nematophagous fungi [10, 11], nutritional supplementation with beneficial forages [12–15], and targeted anthelmintic treatment with the FAMACHA© system, have been put forward [16, 17], frequent use of anthelmintics dominates , to which helminths have become resistant [18–20]. The World Health Organization estimates that about 80% of the population in developing countries depends on traditional medicine for their primary health care needs . Most of the rural small-holder farmers cannot afford the cost of modern drugs , and therefore resort to Indigenous Technical Knowledge (ITK). ITK refers to localized, structured, traditional application of knowledge generated from continuous experimentation and observation of a given phenomenon of interest . In this study, it refers to the use of ethnopharmacological practices, which over a long time have been used to treat diseases and ailments in a given geographical location. The study of ITK is encouraged in Uganda and many African countries because ethnoveterinary practices can supplement modern drugs, and since they are cheaper  they are often practiced by farmers [5, 22, 25]. In addition, drug discovery efforts have been refreshed with the aim of addressing the current resistance problems against the most frequently used anthelmintics . There are a number of studies in Uganda which have documented livestock species-specific ethnopharmacological practices in different parts of the country [25, 27–33]. However, due to limited scope, variation of ITK by culture and changing livestock production practices, diversified knowledge from other regions is needed. Before 1986, the Acholi people in Gulu produced a large proportion of cattle and goats, but the district was ravaged by war for more than 20 years. With peace returning, Gulu farmers are currently restocking the land. In contrast, Mpigi district is part of what is known as the cattle corridor, where livestock production is highest in Uganda. Being near the capital city, it is easy to access modern veterinary drugs. With traditional knowledge being replaced by continued use of conventional veterinary drugs, the utilization of indigenous practices is expected to decrease unless properly documented . To document such indigenous knowledge, this study was undertaken to identify the most common practices using plants to treat livestock diseases in Mpigi and Gulu districts of Uganda. A cross-sectional survey was conducted from August to November 2011 in two districts: Mpigi and Gulu. Mpigi district is located in the central region between 00° 13′ 48″ North and 32° 19′ 48″ East coordinates. The headquarters are located 37 km west of the capital Kampala, and it is part of the intensive livestock/cattle farming corridor in Uganda (Figure 1). Gulu district is located about 340 km north of Kampala, between 02° 45′ North and 32° 00′ East coordinates, with a population that relies on subsistence agriculture . Multistage sampling was used to select the study sites. In each district, two sub-counties were selected. Subsequently, 3 villages in each sub-county were purposively selected  with the help of extension staff, making a total of 6 villages in each district. 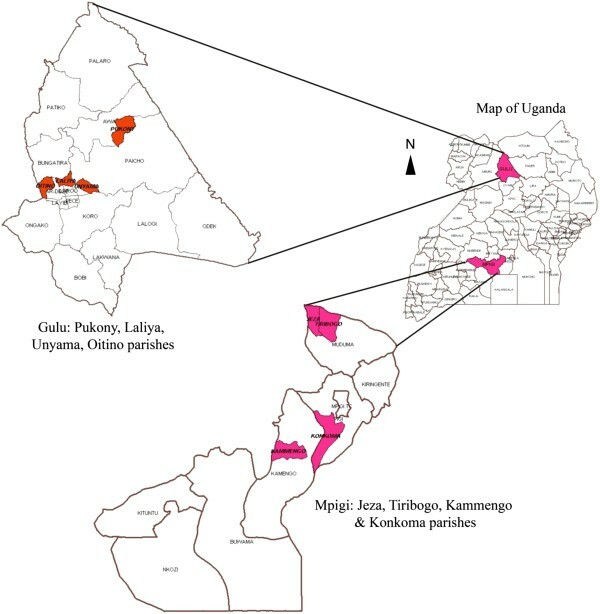 Map of Uganda showing the two study districts, Gulu and Mpigi. An assessment of the different ethnopharmacological practices and beliefs among cattle and goat farmers was completed using standard participatory rural appraisal (PRA) techniques . These included focus group discussions (FGDs) with local farmers, key informant interviews (KIIs), scoring and ranking, as well as problem mapping. Visits to collect plant materials and botanical identification were carried out. In Mpigi, seven FGDs were conducted in Kammengo, Bwanya, Mpigi Town Council, Bulamu, Konkoma and Jeza villages. In Gulu, seven FGDs were held in Bobi, Unyama, Awach, Purong, Ombachi and Custom Central villages. These villages were selected because they represented the peri-urban and rural agricultural production systems. Seventy six and 74 farmers were interviewed in Mpigi and Gulu, respectively, with an average of 10 people (both male and female) per group. Participants were livestock farmers owning at least five ruminants and with more than five years of livestock farming experience. A standard interview guide was used to ensure uniformity of the data collected during the FGDs, after the participants had signed a consent form. The discussions were taped and kept in the local languages (Luganda and Acholi) but later translated for the researchers. In each district, nine KIIs were held, four with veterinary extension workers and five with community ITK persons, using a semi-structured interview guide. Both in the KIIs and FGDs information was gathered on priority livestock and prevailing diseases including helminthosis. Perceived causes, disease diagnosis, treatment methods, plant sources, herbal preparations and dosages were documented. The conservation efforts and challenges encountered while using herbal medicine were also documented. To understand how diseases were diagnosed and treated, participants were involved in practical scoring and ranking of diseases and their treatment. The participants were provided with 100 bean seeds each, which they used to indicate differences in availability of the plant species or varieties mentioned, and changes in burden of disease with livestock species and general priorities. This helped to quantify some items in the checklists and achieve agreement on a given variable within the group. A local name was attached to each plant, and information on its relative availability was recorded . Reference samples of each plant were submitted to Makerere University herbarium for identification by a botanist, and voucher specimens were preserved. Review of each plant’s conservation status data was done in reference International Union for Conservation of Nature (IUCN) red list (http://www.iucnredlist.org) and Convention on International Trade in Endangered Species (CITES) classification (http://www.cites.org). The data were transcribed and entered into Microsoft Excel 3.0. During analysis, data were summarized into major themes by content analysis . Descriptive statistics were obtained for quantifiable data in Statistical Package for Social Scientists (SPSS version 15.0). The scientific family and species names of the plants were obtained after botanical identification. A total of 150 participants were interviewed in seven FGDs conducted in each district. Of these, 87 (58%) were female and 63 (42%) male. On average, the farmers interviewed were 36 ± 9.8 years old (mean ± standard deviation). Whereas 15 (10%) participants had no formal education, 83 (55%) had primary and 62 (35%) secondary education level. The average number of goats was 8.6 ± 3.9 with a minimum of 2 and maximum of 56 goats. The average cattle number was 3.2 ± 2.9 with a maximum of 49. Twenty percent (n = 150) of the farmers had only goats. The average household land size was 2.5 ± 2.9 acres (range 1–30) in Mpigi and 6.5 ± 3.5 acres (range 3–50) in Gulu district. FGDs in Mpigi revealed that the priority livestock was local breeds of cattle followed by chicken (Table 1). Most (>70%) of the pigs, goats and sheep were local breeds, with few crosses and exotic breeds. Species ranked highly in Gulu were goats followed by cattle. Most of the chicken, cattle and goats were local breeds, whereas pigs were exclusively exotic or cross breeds (Table 1). *Semi-intensive management method is tethering (tying animals with a rope at a different fixed grazing/feeding area each day). **Sheep are much less common; preference for goats overrides. Theileriosis or East coast fever (ECF), known as “Amakebe” in Luganda and “Oding ding” in Acholi, was ranked by the farmers as the most common cattle disease in both districts (Table 2). Helminthosis was a commonly encountered condition in all priority species. It was ranked number one in goats and sheep, second in pigs, but was less important in chicken (Table 2). Descriptions of the most common diseases and conditions during interviews were usually accurate. Notably, ECF was not well understood, with farmers claiming that it mostly affects young cattle whose lymph nodes swell when they consume a lot of milk. Helminthosis was well described, including clinical signs such as emaciation and weight loss, rough hair coat, reduced appetite, “pot belly” and detection of worms or segments in faecal matter. Apart from farmers with exotic livestock and chicken breeds, 80% of the local farmers did not regularly treat against helminthosis. However, they treated affected animals, especially when some had diarrhoea or died. “We used the plants before, but we learnt over time that when you want maximum returns or when your animals are crosses and exotic breeds, the choice is to use veterinary drugs, thus we changed” - Female FGD Respondent, Mpigi district. Farmers’ choice and practices for animal disease management in Gulu and Mpigi districts. 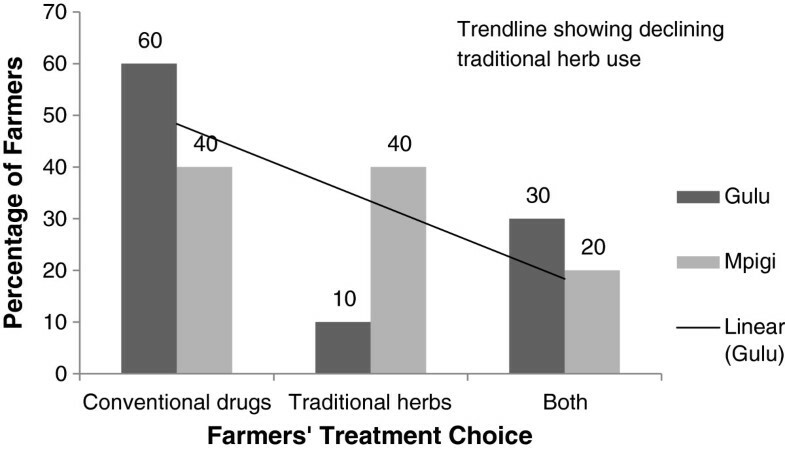 The reasons for low level of use among the knowledgeable farmers were: increased trust in conventional drugs (60%), scarcity of the plant resources (30%) and lower demand from other farmers (10%). There was a significant difference between conventional and traditional drug use in Gulu and Mpigi districts (χ2 = 24; p < 0.001). Farmers in Mpigi mentioned six plants (no Acholi names specified in Table 3), which were not used in Gulu. The latter mentioned one plant, Hyparrhenia rufa (“Ajuu”) not used in Mpigi. Different plant names in English, Luganda and Acholi were given (Table 3). - Boil dry leaves with little rock salt and drench or crush fresh leaves and drench. - Pound the bark and leave to dry. Soak 3 handfuls of pounded dried bark in water (2 hours) and drench 1 cow or 2 goats. - Mix with Aloe spp (Flower and leaf)+ Opium. *Availability of the plants varies; + Rare or endangered; ++ Available but not common; +++ Ubiquitous and quite common. **Month and year indicated for collection date. ***One commonly used English name; some have many while others have none as indicated in the table. ****Habit: G: Grass; H: herb; Li: Liana; S: shrub; T: tree. Plant parts: B - Bark; L - Leaves; La - Latex; Fl - Flowers; Fr - Fruits; R - Roots; S - Seeds. aBoil leaves or crush fresh leaves then drench; also used for stomach ache and fever in People or animals. b Used on wounds, spray to prevent mites. cCrush and mix with water then spray animal to treat ectoparasites. dCrush and boil leaves – drench treats uterine prolapse; decoction also treats cattle skin diseases including mange. eAlso for estrus induction (bring animal to heat) and smear on the wounds for wound healing. fAlso treats theileriosis and wounds. A summary of 40 plants and seven practices used in treatment of livestock and chicken diseases in Gulu and Mpigi districts. Details of preparation, plant part used, conservation/biodiversity status, common English, Acholi and Luganda names are provided. Twenty plants were used to treat helminthosis; wounds and ectoparasites (8), Theileriosis (6), retained placenta (5), Bovine Ephemeral Fever (4), and one each for Newcastle disease, uterine prolapse, constipation and retained placenta. “We only use chips of roots from big trees so that we do not completely destroy the source. Most of these plants are rare and many people use the same tree; thus we do not encourage use of roots in traditional medicine”, Female FGD Respondent, Gulu district. Seven non-plant practices such as orally administering cooking oil and soapy water to treat constipation were cited. Human urine mixed with ash and a decoction of Ugandan edible grasshoppers were also used (Table 3). The majority (80%) of farmers with knowledge of ITK said and believed the practices and plants were efficacious and safe, showing minimal side effects. Doses therefore were not standardized but indicated roughly. For example, a “mound” or “handful” of plant material mixed with a “bottleful” of water was more common expressions than quantifiable amounts or volumes. However, they said that some plants, such as Phytolacca dodecandra and Senna occidentalis, if used in large doses posed serious toxicological effects. Farmers obtained > 80% of the plants from wild flora or weeds, usually near their homes. About 15% of the shrubs or herbs were specifically grown or conserved around homes for medicinal purposes. The longest distance traveled for rare plant materials was 15 km in Gulu district. The majority (>70%) of shrubs and forest trees were obtained within 2 – 6 km. The access distances were shorter in Mpigi district and the longest distance was 5 km from designated forests. Herbs followed by shrubs were the most common plant types (Figure 3). 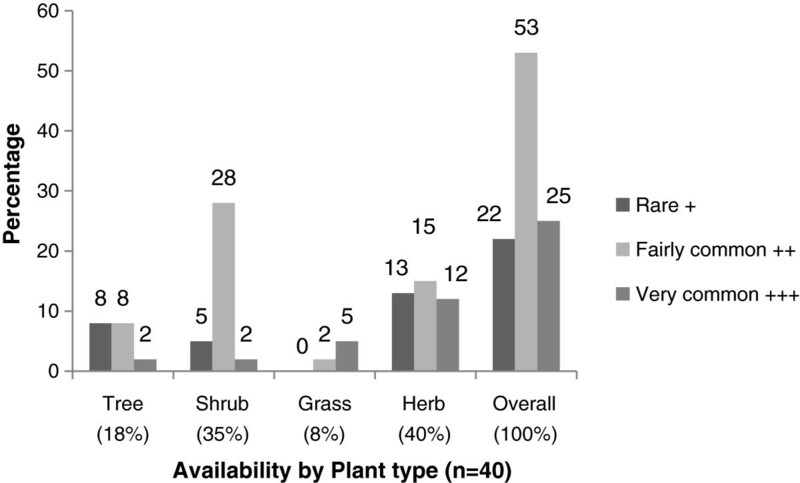 A graph of relative availability of the plants demonstrated that 53% were fairly common; mostly the shrubs and 12% of the herbs were very common. Trees were rare or fairly common, depending on the species (Figure 3). International conservation status of 95% of plants was not evaluated (NE) by IUCN except Euphorbia tirucalli L. which was categorised as least concern (LC) and Carica papaya L. as vulnerable (VU). Categorisation by CITES indicated family Euphorbiacaea and Aloe vera as plants traded with caution (Table 3). Relative availability of plant materials within communities. Most of the plants were used in combination, and limited access to some rare ones prohibited the full scale use of such ITK. Most treatments were not openly shared, with few people having the knowledge. The doses were not well standardized, with wide variations in treatment duration and amounts to administer. This is the first detailed survey of livestock ethnopharmacological practices from Gulu district. Evidently, there was lower utilization of ethnopharmacological practices in Gulu district compared to Mpigi. In Gulu district, younger farmers (<40 years) portrayed less knowledge, possibly as a result of the breakdown in the ‘traditional social safety nets’ breakdown as an outcome of war or insurgencies in the district . The role of traditional social safety nets adaptation and resilience has been recognized in Zimbabwe . Similarly, goats instead of cattle were first priority due to reduced land sizes and cattle losses incurred during the previous war. The impact of the war is still felt in the economic performance of the district [38, 39]. The current study established 40 plants from 34 genera and 22 families, and 7 non-plant practices, used to treat livestock diseases. A previous global study documented that more than 119 conventional drugs prescribed were derived from plants. The bioactivity of 74% of 119 plant-derived drugs was discovered during validation studies of documented traditional uses of the respective plants . Therefore, the use of the plants identified in the present study in advanced searches for new drugs is paramount and can lead to novel discoveries. Documentation of ITK nevertheless, guards against loss of traditional knowledge due to limited inter-generation transfer [24, 25]. More females than males participated, and a majority of the respondents at least had primary level education. Women have better health seeking behaviour than men, and herbal medicine is practiced in a similar pattern [21, 27]. According to this study, men mainly did the ethno-diagnosis and treatment of livestock diseases. This is probably because taking care of large livestock such as cattle is by tradition considered male gender role in Uganda. This could also mean that much of ITK in livestock is mainly passed to the next generation through men. The participation of more women than men during FGDs could therefore mean that women considered this an opportunity to learn more about livestock. Indeed, FGDs in this study were a learning platform for many participants, who exchanged information on the different plants used for treating different diseases and conditions in livestock. The numbers of plants and preparation methods described in this study were restricted to the prioritised diseases/conditions for the animal species identified (Table 2). In addition, the study documented the scientific, English, Luganda and Acholi names, which enhances intra- and inter-generation dissemination. The relative availability and conservation status of the different plants was reported, which few studies have achieved. The most common mode of preparation was water extraction (75%), where the plant parts were crushed and mixed with water before drenching. This is similar to previous findings  that showed the use of 37 plants against helminthosis in livestock from pastoral communities in Uganda. Decoction (boiling plant parts in water) was more common than infusion (submerging plant parts in hot water), and this is in agreement with a previous report . However, this is contrary to a finding that most plant preparations in Bulamogi county, Uganda, were by infusion and less commonly by decoction . The study in Bulamogi described more than 200 plants and practices for treatment of various human ailments but with less focus on livestock diseases. Different studies have documented usage of some of these plant species in different parts of Uganda and Kenya [5, 25, 27, 28, 30, 32, 41, 42]. All of these studies are area-specific, prospecting for different livestock or poultry diseases, whereas this study was focused on the farmer prioritized conditions and remedies. In one study, up to 29 plants were documented for the treatment of ECF, five for diarrhea and one against intestinal worms . Another study  documented 11 of the plants mentioned in the current study but five of these were prepared differently. Such variations in methods may cause significant difference in bioactivity of plant material due to variation in concentration of bioactive compounds  even when the same plant is used. In a study of household herbal medicine used in four districts of Uganda, 41 plants were documented but noted the loss of ITK . In pastoral Karamoja, 209 plants treating 130 conditions were documented . A study in Mpigi district in 1993 documented 46 plants used for a wide range of conditions  but only 16 (35%) of these were reported in the current study. What is interesting is the wide variation of ITK over time, even in the same or similar geographical locations. Knowledge levels decreased by age, and the people younger than 40 years were less knowledgeable, which is similar to findings in Kenya . Also similar to previous findings [5, 42], males in the present study were more knowledgeable than females of similar ages. The information was not freely shared, unlike in pastoral areas [3, 25], possibly because some people were believed to have native treating ability. The farmers believed most plants were safe and non-toxic [25, 31]. However, plants known to be toxic were used, albeit with caution in advance. In these cases, there was an attempt to give clear amounts within which the doses were safe. Use of non-plant practices, like cooking oil and soap, has been documented before [27, 30, 42]. It is notable that these practices varied with the condition and usually no standard amounts were specified. The use of plants and non-plant practices in this study demonstrated that farmers have great wealth of knowledge of disease conditions affecting their animals. The validation of this information through well designed scientific research and dissemination of such findings will enhance ITK utilization. In Mpigi and Gulu districts, farmers used a variety of 40 plants and seven non-plant practices to treat livestock and poultry diseases. More than half of these plants were readily available in their environment while 25% were rare, and thus their use is compromised. The ethnoveterinary knowledge level was low among people below 40 years, especially in Gulu which may be attributed to the negative impact of prolonged war on the traditional social safety nets which are crucial in imparting ITK to the young folks. This was exhibited by fewer farmers practicing ITK in Gulu District. This calls for heightened sensitization about use and conservation of these plant resources in this district. Validation of efficacy of these ethnopharmacological products is also imperative to enhance full-scale use of these products in livestock production. This study was funded by the Swedish International Development Cooperation Agency (Sida) and Makerere University. We thank the farmers who allowed us to document this information about these plants and practices. The field data collection was supported by Ms. Sarifah Nabambejja, and Mr. James Ndukui helped us to preserve the plant materials for submission to the herbarium; we gratefully acknowledge their efforts. Mr. Mugagga Malimbo and Dr. Eva Tydén helped with drawing the study area map. Dr. Samuel Okech, Dr. David A. Morrison and Dr. Eva Tydén are thanked for editing this manuscript. All authors contributed equally to this work. IN and KI took the lead in design and field implementation of the study, whereas JH, RA, and DO supervised the work and supported the writing process. JH, RA and IN contributed to data analysis and presentation. RA, KI and JH supported the editing process. All authors read and approved the final manuscript.